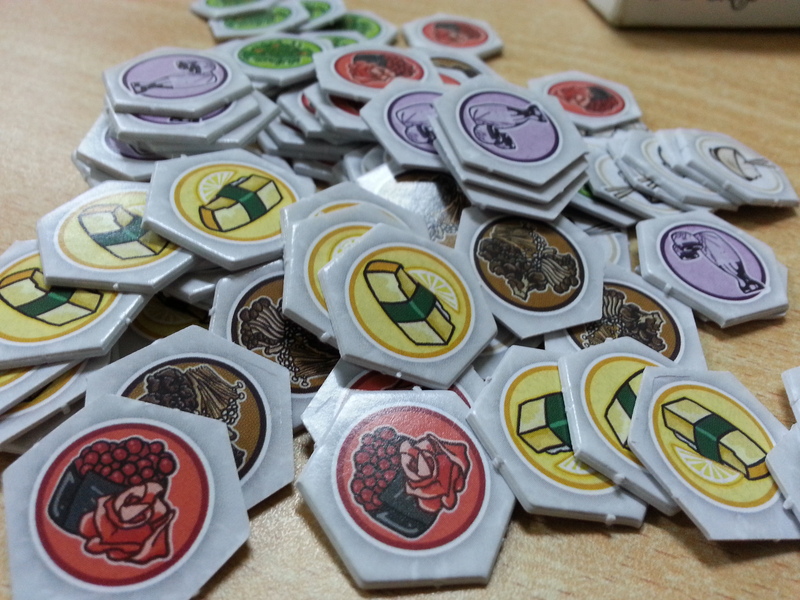 Our traditional business model is printing games in the $5-$15 range, which ship with only the bare essential pieces. This helps us reduce our inventory risk, and essentially puts half of the manufacturing burden on the consumer, who must still provide spare parts like dice, counters, play money, and so on. Thus, we can sell a game that might be worth $40 with all the bits, and meet our customers halfway. It’s especially convenient that the best chips for Veritas, at least at the time of this writing, can be found really cheap. If those chips were in our box, we could never give you such a good deal! 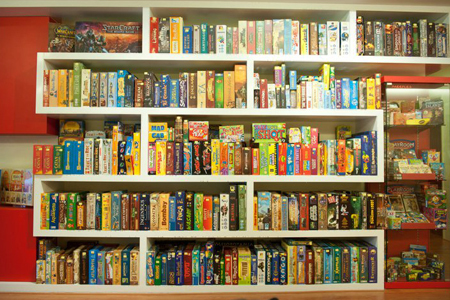 James Earnest is the founder of Cheapass games, which he founded on 1996 along with his most famous board game titled Kill Doctor Lucky, which won the Origins award for the best abstract board game in the following year. He mostly designed all of Cheapass games titles and most of them are free to download. Some of his games are Deadwood Studios USA, Unexploded Cow, Veritas, Pairs, Buttonmen, Falling, Witch Trial and of course Fish Cook. Now let us look deeper into Fish Cook. I know this game from a friend of mine who ordered this game and I was curious to ask him what kind of game this is. I did find the game curious because of the game box, colorless with simple black texts and sketch and white background. Now that’s not something that you see in most of board game boxes. Not much theme in the game, it’s a cooking game I suppose which involves collecting ingredients along the way. Players are chefs that need to create original dishes for their restaurants to gain profits. In the game, chefs also have to go to market to get all the necessity ingredients in the recipes. After collecting the ingredients, they can cook recipes and sell it to gain some profits (naturally they need to sell the dishes higher than the price of the ingredients to make a profit, the bigger the margin of their profit is the better so they can collect the most money at the end of the game). I already mentioned the game box art, which is… standard. The rest of the components are also standard but the cards are better with colorful artworks. Not much of commissioned artworks on this game and everything is just based on the necessity for the game to be play-able. 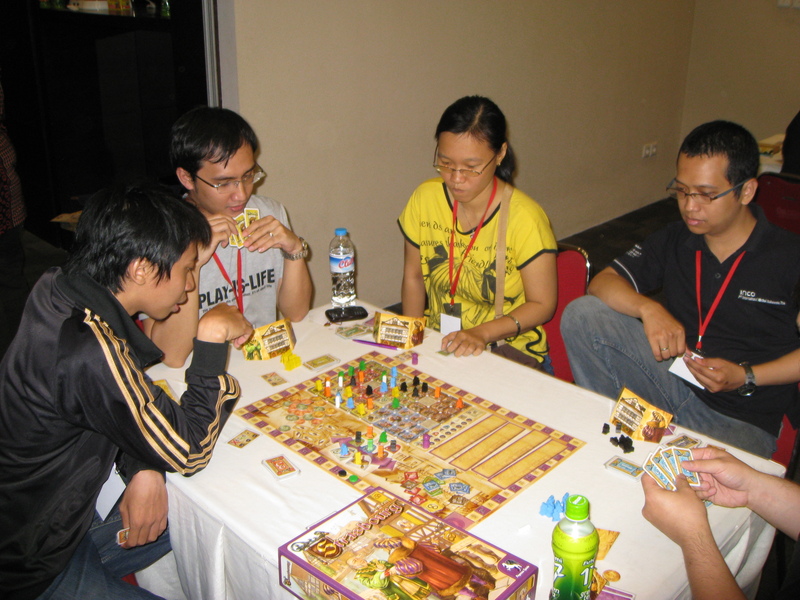 The game comes with 4 parts of game board (made from thick paper material), cards, game round and first player tokens and also ingredient tiles in 6 types. Players need to provide 12 6-sided dice and the money in different denominations (preferable denominations up to 100 value to keep track the money easier). 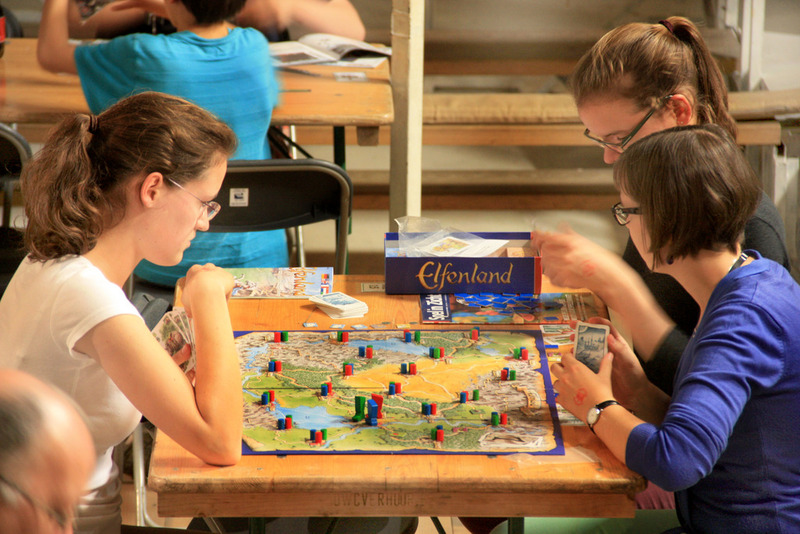 The game consist of several rounds (based on number of players, 3-5 rounds) shown as days. In each day players will have to go through 2 phase, day and night. During the day phase, each player will take turns clockwise to collect ingredients / buy recipes. There are 6 different types of ingredients as well as 6 different grades of fishes. Ingredients are filled by rolling a die to determined how many of them added to the supply. Fishes are presented by the dice which rolled before each day starts. 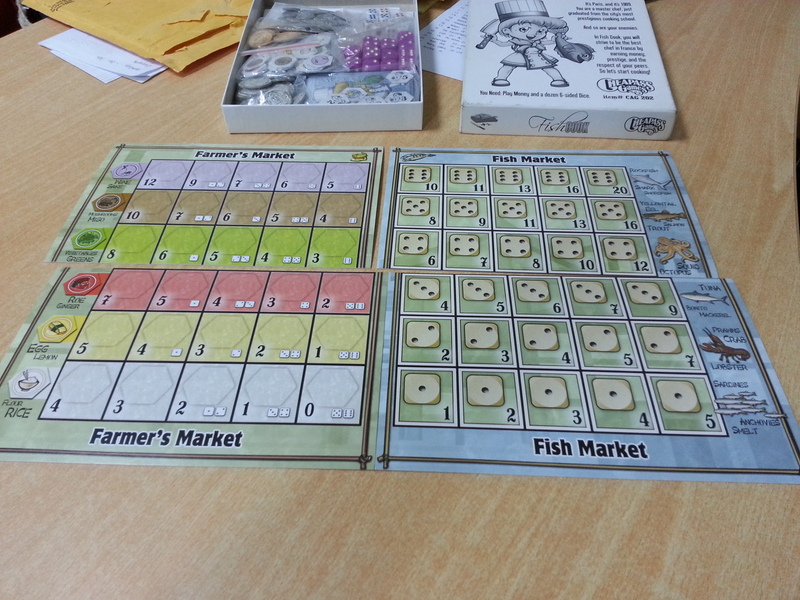 The dice roll results determine how many fishes are available and in what types. The price of the ingredients and fishes are vary based on the stock of the specific type at the moment. Ingredients / fishes with surplus supply are cheaper than the ones with small amount supply, which really related to basic economy principle of offer and demand. Players can also take his turn to buy new recipe instead of ingredients. They buy recipe from the available (cooking school) with the cost of 5 coins, or buy a recipe from the top card of the draw pile with cheaper cost, 2 coins. The recipe cards consist of the required ingredients to make the dish (fish is the only ingredients that always presents). First grade (die value of 1) can only be used for a recipe that required grade one fish, unlike Sixth grade fish that can be used for any dish (since Sixth grade fish is the highest grade), but of course the higher the grade is, more expensive the price is (but more flexible). 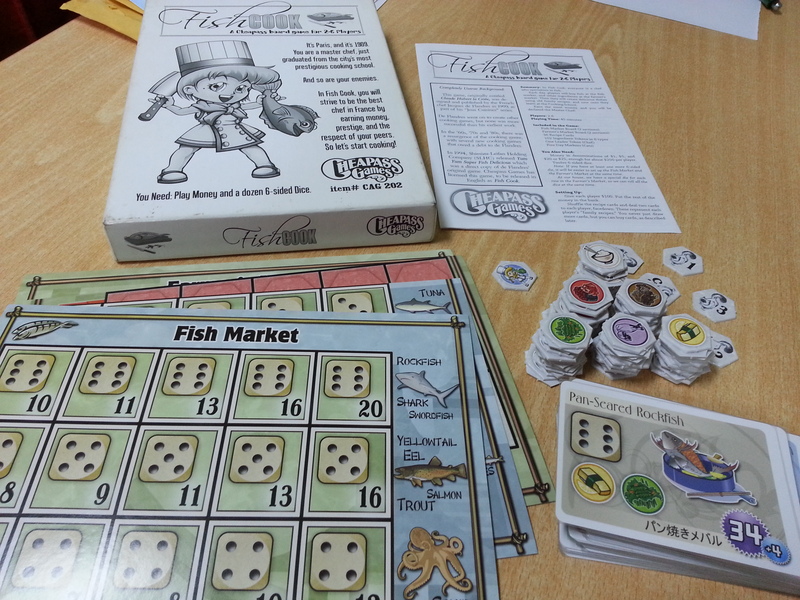 A day phase ends when one of some certain conditions is met, these conditions are when all players have pass their turn (if a player pass his turn, he can take his turn again in the next turn), when one type of ingredients (not fish) is out of supply or when there is no fish left on the market. Once a player trigger this, all other players take one final turn (including the triggering player). Pass the firs player token to the left player who triggers the day end and the night phase starts. Starting from the player with the first player token, he cook one of his recipe (if any) and gain profits. If he cooks a recipe from his hand, he gain the bonus as well (return the ingredients and fish required by the recipe). He can also cook an already played recipe from his tableau or from another player’s tableau or even from the available recipe on the center of the table. When he cook his own recipe he gets the bonus as normal, but if he cook a recipe that belong to another player, the bonus goes to the owner of the recipe and the player will have a chance to steal the recipe. 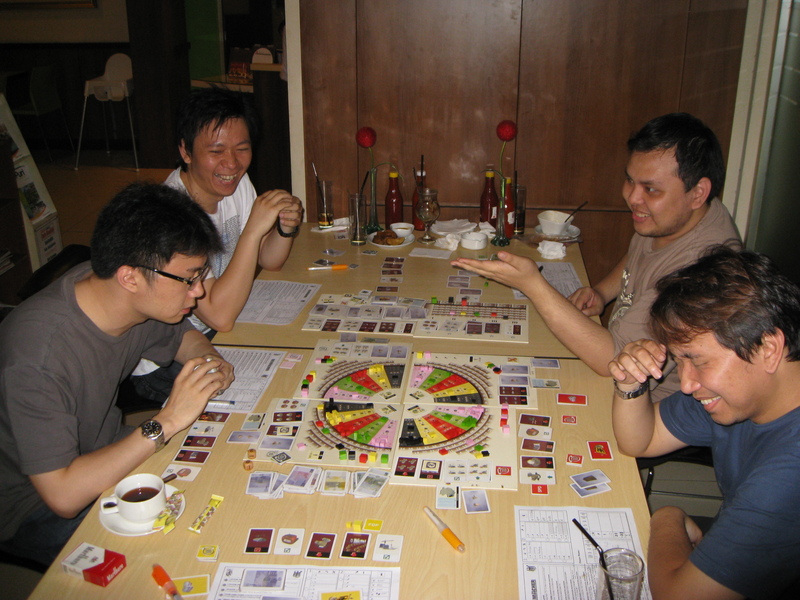 The player roll one die and if the result is equal or higher than the bonus value, he can take the recipe and place it on his tableau. During the night you must pass your turn if you cannot cook anything, and if you pass while you still have fish, you must throw one fish away. The night phase ends when all players’ fish are cooked or discarded. Player then can keep his leftover ingredients for the next day. Next day begins, refill the markets and the cooking school. After the last day is over, the game ends and final scoring is taken place. Players who has the most recipes in each fish grade get points based on the value of the grades (if there is a tie, all tied players received the bonus). So the player with the most recipes of Sixth grade fish gain menu bonus of 6 points and the player with the most recipes of Fifth grade fish gain menu bonus of 5 points and so on. Each player then sum his coins and points together to the the total points, the player with the most points win the game. In overall, this game is simple and easy to explain. It’s straight forward, players collecting ingredients and cooking dishes to get more money. The game is very economic and it’s crucial to get ingredients cheaper than the money and potential bonus of the dish to get a good profit margin. Sometimes players are faced upon situation that they need to get ingredients and / or fish in higher price, this will determine how big the profit margin players receive in compared with the efforts and turns invested to complete the dish. If the profit is not really good, it’s better to find a better dish (of course considering that maybe you want to earn the most grade of fish). 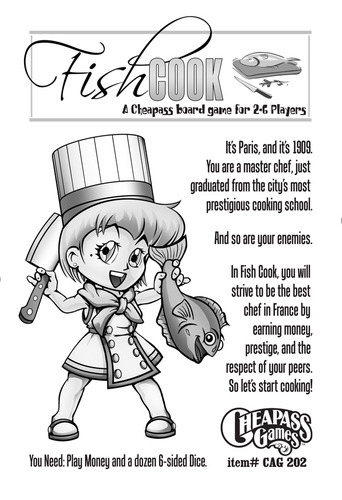 Players will often take new recipes from the deck or cooking school, but it’s a valid and important strategy to steal another player’s recipe to cancel their majority on grades of fish. This game can be played by 2-6 players under 30-45 minutes and it has a good theme for either adults and children, men and women, it’s about food, everyone loves food. Okay, first of all the game looks minimalistic interesting and to be honest after a first play, I was hooked so I bought the game (instantly, as it’s as cheap as 6 bottles of beer). It was supposedly provides cheap games to play but in the end some of us (my friends and me) bought a special set of dice and money tokens for this game, which led us into extra expenses. The game is very straightforward, buy ingredients, cook and score points but there are some points of strategy or tactic in this game and also decision making. This is also a game that I usually bring to meetup for it’s flexibility (newbie friendly, easy to learn, and short game time and it ranges up to 6 players), very flexible (if you are bored with 7 Wonders, which is more newbie-intimidating).